Filled with wildflowers, plentiful birds and other wildlife, lakes, ponds, creeks and trails that wind through and among its many hills, bogs and wetlands areas, the 2,200-acre Moraine Hills State Park offers what promises to be a unique trail half marathon and 10K run along a course that’s both marked by its natural beauty and within a short drive of one of the nation’s busiest and densest urban metropolitan areas. Named the Moraine Hills “Run for the Hills” Half Marathon & 10K race, the event has its 7th annual running this fall, along an out-and-back course that will take runners deep into the park’s hills and trails. Both races start and finish the area of the park known as the Northern Woods, which lies near the northwestern corner of Lake Defiance, the lake that sits near the center of the park. Runners in both the half marathon and the 10K will set out from the Northern Woods and head around the perimeter of the lake; between the second and third mile marker, those running the 10K will split off from those running the half marathon, who will continue on along the trail toward the McHenry Dam, in the southwestern section of the park. 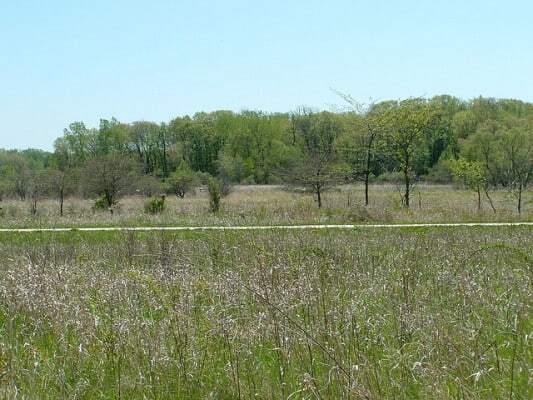 Runners in the half also run along the trail that parallels the Fox River (which flows through the park), and then meet up with the Leatherleaf Bog Trail, which connects with the 10K course for the last three miles of the race into the finish line back at Northern Woods. The terrain for the race changes in different sections of the park, and runners can expect a combination of paved bike trails as well as natural-surface trails along the bog trail sections of the race route. The race organizers — which include both the Friends of Moraine Hills State Park as well as the Fox River Running Club, a local running group based in McHenry — add that runners should expect some quite hilly terrain, especially in the early miles of the half marathon. The race is limited to the first 400 entrants, so runners looking to sign up are encouraged to do so early. Located in the northeastern corner of Illinois, just over 50 miles northwest of downtown Chicago, the city of McHenry typically experiences mild to moderate weather conditions in the early fall season, as September temperatures average between 51°F and 73°F. On the day of the race (Sep. 28), the average low is 46°F and the average high is 68°F. See the race route map for the Moraine Hills Run for the Hills Half Marathon. To reserve your spot in the 2019 running of McHenry’s Run for the Hills Half Marathon or 10K race, visit the event website below. Ever run in the Run for the Hills Half Marathon? Share your impressions here, or post your review in the Comments box below. Hi. I heard I placed 3rd in my age group and there were medals for that. I called running depot and they said they were no longer holding them. Do you know how I would receive mine?